The lights are off, the floor is covered in glowsticks, illuminating the movements of South students. A yoga instructor whispers guidance as they ease tension from their bodies. “We wanted to start off with events in a right state of mind and with positive thinking,” Contreras said. She hosted a yoga class to help students unwind and prepare for the new semester and as well as help them make some new friends. At these events, students get to meet people and try new things, and it’s a new experience, she said. South student Niomi Miranda enjoyed the event and the message it sent. “‘Glow with the Flow’ was an amazing experience. It surpassed my expectations, I felt so welcome and had a lot of fun,” Miranda said. 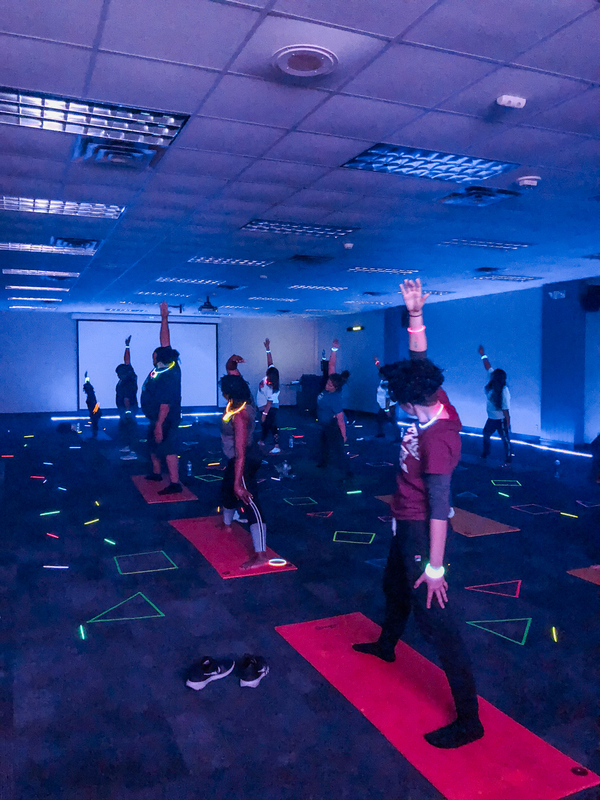 Students can go to these types of events after class to de-stress and socialize for awhile. “It’s nice to have something to come to, especially when you’re stressed,” Miranda said. South student Diana Beltran said she was intrigued by the theme of the event and wanted to fulfill her curiosity. Students were visibly more tranquil after the event as they mingled by the snack table. “The lights off and music made it really mellow and the whole thing was a very relaxing good time,” Beltran said. South student Edward Pizana attended the event with a goal in mind. “I’ve never done yoga before but I’m trying to better myself, so I came,” Pizana said. The relaxed mood of the event made it so students could loosen up and clear their minds, he said. “I feel real great, and I’m looking forward to the next event they’ll host,” he said. Students who want to get more involved in these events and attend future ones can check their emails for updates from student activities, Contreras said.